Leicester Business Festival is an annual, two-week Festival incorporating hundreds of free business events – staged by local organisations and which all take place in Leicester and Leicestershire. It was the first two-week business festival ever to be run in the UK and, in its fourth year, it is now a firm feature in the local business calendar. Each year, the Festival sees over 100 events attended by over 10,000 people and it is easily the largest business event in the region. 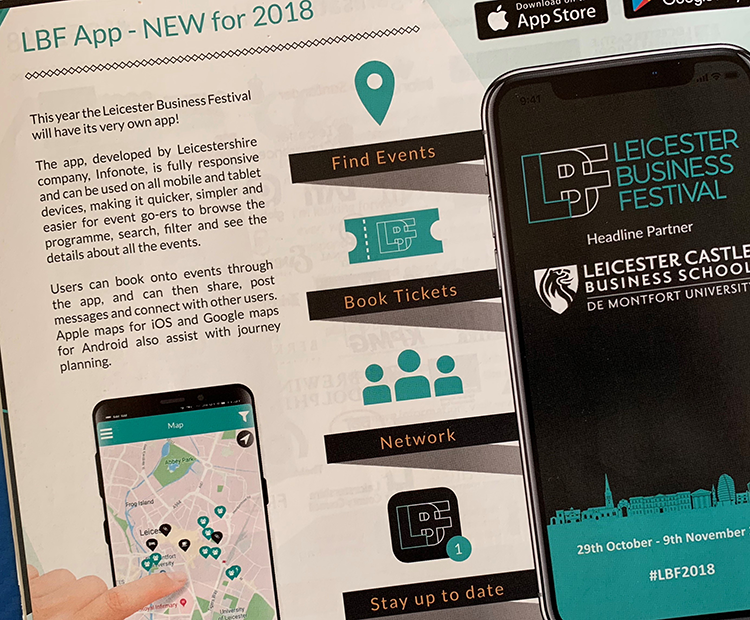 Working with the Leicester Business festival team we developed an app for #LBF2018. The app must integrate with the ticketing system so that users can register via the app. Users must be able to view and organise events on the app. Users should be able to share event experiences with others. The app must connect into existing LBF feedback mechanisms. It was an absolute thrill to be invited to develop the very first LBF App. It was initially a challenge not to get carried away, but with limited time available for the development and testing, it was important to get the basics right and look to the future for additional innovation and flare. A free to download App available from either the Google play store or the iOS App store, supported by a custom dashboard for information. The app included integration with Apple maps for iOS and Google maps for the Android devices. We felt that utilising the native mapping solutions for both platforms would provide a better user experience. We tapped into the festival twitter feed, allowing users to stay in touch with information about the festival events and added further social sharing options against each specific event listing. As this was a business app, we felt that it would be best served by utilising the sign in protocols offered by Linked in and thus allow us to offer access to networking between individuals attending an event who might be interested in doing so. Other integrations included links to the feedback forms and of course the ticketing system, both pre-existing elements of the festival infrastructure.